A popular street camshaft used with pre 1985s original overhead valve OEM engines, the hydraulic flat tappet cam is commonly used in up to mildly aggressive performance profiles. The flat tappet lifter has a flat appearing base (this surface is actually slightly crowned) that rides on the cam lobe face, rotating slowly within the lifter bore to promote proper oiling. Internally, the lifter features a cavity that fills with oil and a piston that is depressed by the pushrod (and valve spring). This "hydraulic chamber" provides a cushion of fluid to soften the impact on the valve train, creating room for expansion as the engine reaches operating temperature. 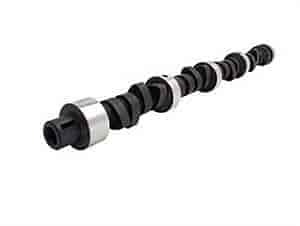 Hydraulic flat tappet camshafts deliver quiet operation at street to mild racing engine speeds. The biggest advantage to hydraulic flat tappet lifters is that they do not require constant maintenance to ensure proper valve lash. Hydraulic flat tappet camshafts/lifters are pre-loaded at initial start-up and require little, if any, maintenance from that point forward. Flat tappet lifters can only be used once per camshaft and must be replaced due to wear patterns created by the direct contact of the cam with the lifter base. COMP Cams 995-16 - Dual Valve Springs I.D. of Outer Dia. : 1.073"